Having previously read few other titles by Julia Donaldson, I decided to try and locate another one of her books and across this one. I bought this from PassaroBooks for 150/-. The cover is pretty simple with the title and an illustration. 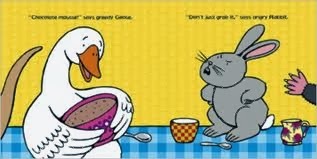 The illustration; a goose holding a bowl of mousse, perfectly depicts the title. 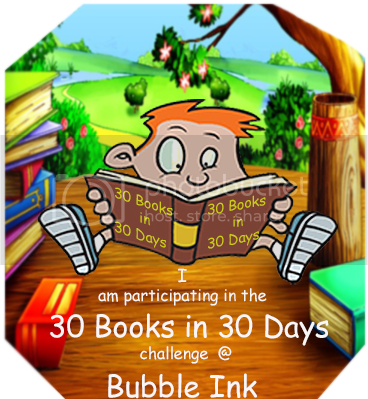 It gives young readers the chance to look at the picture and link them to the words of the title, a good way of young readers creating an understanding that words have meaning. The basic story is of a dinner party, where all the animals sit around the table, and no one seems to have any manners. It is a picture book with simple text, limited to one sentence per page. Good manners simply aren't on the menu when these rascally friends get together to eat! Duck won’t touch his carrots. 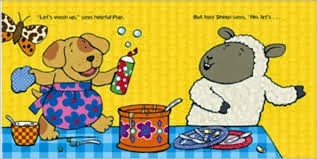 Moth’s munching on the tablecloth, and lazy Sheep would rather sleep than wash the dishes. As other Julia Donaldson books, the rhyming is still present, but what stands out to me in particular is the sentence structure. In each sentence there is always an adjective in front of the name of the animal. So, although the sentences are not detailed or extensive it still provides an opportunity for young readers to build on their vocabulary. There is an obvious pattern in the sentence structure as well as the actual length of each sentence, allowing the reader to anticipate what they are going to find as they turn the page. This book is enjoyable especially because of the illustrations by Nick Sharrat, which bring out the comical elements of the story with the different animals making lots of mess and joining in with the preparation of the food. Food, Animals, Manners - All in a single book. Some unusual animals pictures catch the attention of the kids. 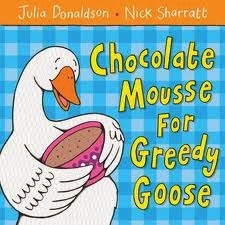 She loved goose drinking chocolate mousse on the book cover. She practically memorized it after few reads which became its own fun, as she would "read" it to me. She most of the times talk about Moth's eating the cloth, and questions me why is it so? I highly recommend this book for tots, as the pictures make it more educational too, as you can teach them about the animals, food items and some vocabulary words. Book Review : Where's that cat? Sensory Play, Is this Really Necessary? Book Review : That's Not My Bunny! !